Same old, same old .... And by that I mean I'm pretty much keeping my nose to the grindstone and plugging away on my hexies for Mosaics. Doing so means that I am truly getting to the finish line on the borders. Three sides are ready to be squared up and attached to the center medallion and the fourth? Progress was made last night. I totally forgot about guild meeting until my riding partner called in the afternoon to say she wasn't going to make it. So glad I was already working on dinner since now I had to scurry out the door soon! There are twelve hexie flowers on the long borders. I flew out of the house (on my broom! Hahaha!) headed for guild with my hexie bag. I managed to finish up hexie #9 and started on #10 before our speaker began our program. Bad kitty! Polly feels the need to see just how much progress I'm making. Haha! 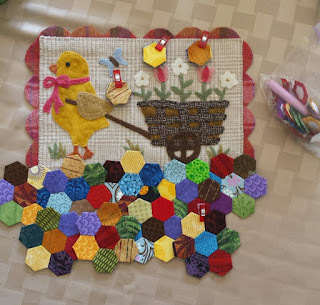 These hexie photos were taken before guild. The one with the little red clip on the bottom right is the one I finished up. The bright yellow hexie clipped to other hexies at the top in the middle is the one I started. On to another project. 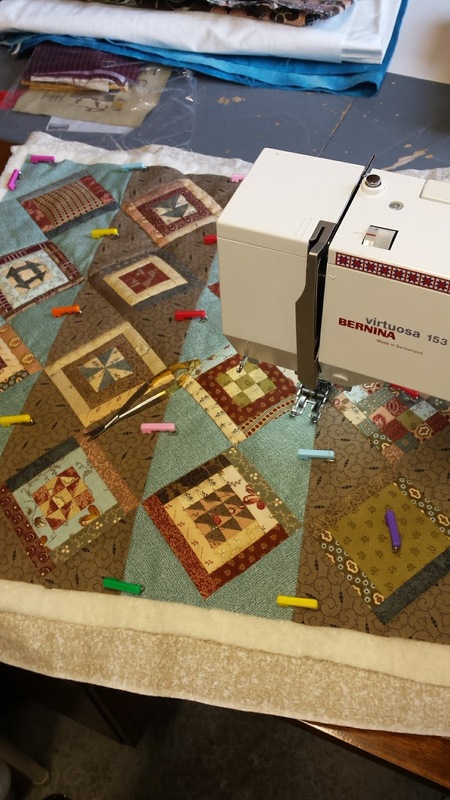 Do you remember the Marvelous Mini Monday Sew-a-Long I participated in with Temecula Quilt Shop? 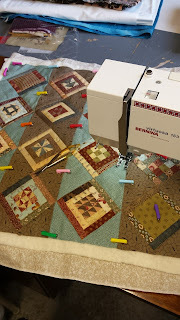 I've been trying to spend time in the basement quilting it. I forgot how tiny these blocks are: A mere 4"!!! Getting close to having it done. Then I'll have two wall hangings to bind -- this one and Clam Shells. I'm going to try a new method that I learned on The Quilt Show with Edyta Sitar as guest. I'll let you know how that works out. 1930s Farmer's Wife Sampler has taken a back seat lately. I cut out 4 or 5 blocks and selected the fabrics for another. They are all waiting on me for Friday. 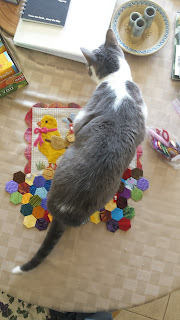 I have an all-day quilt retreat and I think they'll be the perfect project to work on ... along with a Springtime wall hanging that I've already prepared. Yay! Speaking of Spring, as I was washing dishes yesterday afternoon, I saw this welcome sight on the deck railing. It's a blue bird, which means Spring is just around the corner. 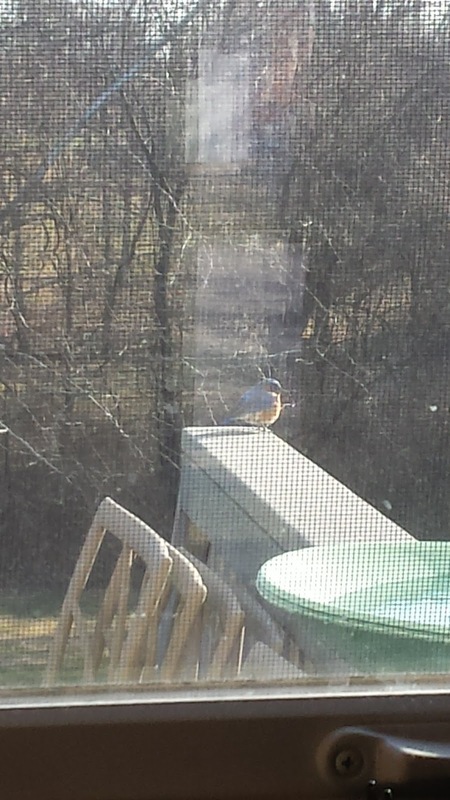 I know he's hard to see but I had to take the shot through the window & screen before he flew away. Also, I'm not sure how skittish they are so I wanted to be quick! Here's hoping you have a little Springtime sunshine in your day! Linking up with Anthea at Hibiscus Stitches. It was PYT yesterday!